برای دانلود استاندارد UL 1069 کافیست با ما مکاتبه کنید. پس از واریز هزینه فایل استاندارد Hospital Signaling and Nurse Call Equipment ارسال می شود. مشخصات استاندارد برای سیگنالینگ بیمارستان و تجهیزات تماس پرستار در ادامه آورده شده است. استاندارد UL 1069 شامل 117 صفحه است. 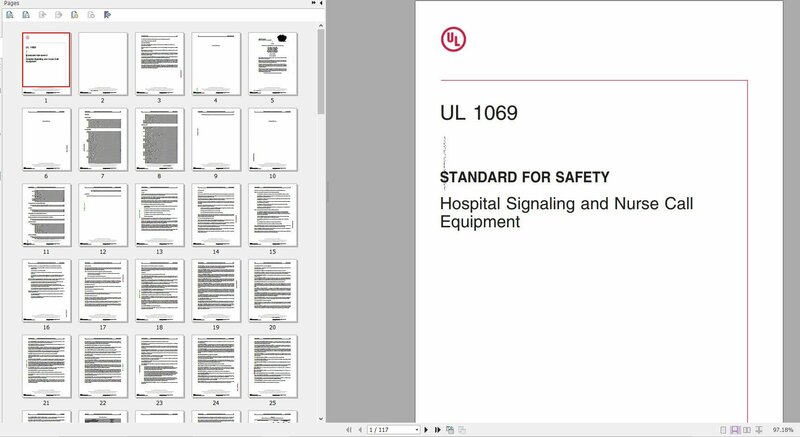 1.1 The requirements in this standard cover the individual units and equipment that operate within the context of a fundamental hospital signaling nurse call system (NCS). 1.2 A fundamental NCS provides audible and visual communication between patients and staff in a health care facility and conforms to the minimum requirements established in the Health Care Facilities Code, NFPA 99, and the National Electrical Code, NFPA 70. 1.3 Accessory equipment or devices which are intended to be interfaced with a fundamental NCS to initiate routine calls or supplementary operation and which do not initiate emergency or code call signaling can be evaluated for compliance with applicable requirements described in this standard. 1.5 A fundamental NCS may employ a wireless interface to perform fundamental operations or a supplementary operation such as notification at a redundant portable nurse’s station. 1.6 The units comprising a fundamental NCS covered by this standard are intended to be installed in patient care areas, staff areas, and support areas of a health care facility in accordance with the National Electrical Code, NFPA 70, and the Health Care Facilities Code, NFPA 99. 1.7 These requirements do not cover medical and dental equipment, line isolation monitors, X-ray equipment, electrically heated pads, therapeutic lamps, refrigerated oxygen therapy equipment, food warming cabinets and carts, equipment employed in inhalation anesthetizing or hazardous locations, office intercoms, or similar equipment and products covered by individual requirements. 1.8 These requirements do not cover equipment employed in an area of hyperbaric oxygenation, in which a patient is exposed during oxygen therapy to pressures greater than ambient atmosphere.